A trip to the beautiful beach at Blyth has always been a great day out, but you can now make the most of your surroundings by renting a fabulous brand new beach hut on the promenade! The Northumberland coast is famed for its long stretches of sandy beaches, and Blyth’s south beach is no exception. The beach huts in Blyth are the only huts in Northumberland, and as well as the stunning views across the sand and sea, they are perfectly situated for access to a brand new children’s play area, walks, cycle paths and a very popular fish and chip restaurant and take-away! Blyth town itself has an attractive park with a fantastic children’s water play area, a thriving market place, and of course, Blyth Sports Centre – a large leisure facility with a swimming pool and other great sport, leisure and catering facilities. 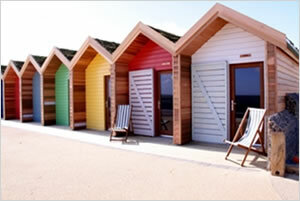 The beach huts are situated on the main promenade in Blyth, Northumberland. They overlook a long strip of golden sand – popular with walkers, surfers, canoeists, sea anglers and families alike. There are 20 beach huts altogether - 2 rows of 10. Each hut has a ‘green’ living roof and sits on a timber deck. The timber huts themselves are stained and painted in a variety of bright colours. To further enhance their individuality, each beach hut has its own name. Children from the local primary school named the huts, and youngsters made their own piece of artwork to go with the names which are displayed inside each hut There is also a new amenity building called the Dave Stephens Centre a short distance from the beach huts where there are public toilets and some external showers. Hire per day will cost you £21.50. You will get £5 back when you hand in the keys. Collect the keys between 8 and 10am from the Dave Stephens Centre and hand them back in at 7pm. Huts will have 4 deckchairs and 4 hooks for hanging your bits and bobs. A built in kettle will be provided, however there are no electrical sockets in the huts. Telephone: Blyth Sports Centre reception on 01670 542222 for more info. The Dave Stephens Centre has an excellent meeting space with a fabulous view of Blyth's coastline. The community room is perfect for meetings, seminars training sessions or workshops. The room can host up to 30 people theatre style and up to 24 people board room style. A flip chart and white board are available for use plus access to tea and coffee making facilities.